The Benefits: Why Train Full Body? Full body training is the king of gaining strong, powerful muscle. “Bro splits” might be popular within the bodybuilding community, but for most of us they’re not going to be optimal. These programs focus on training 1-2 muscles each session and can take up to 6 days a week with a lot of variations for one muscle group. Full body training comes with all the same benefits, but with an easier schedule and the ability to balance your workout with your life. When you’re new to training – or you’ve taken time off – you can make rapid gains in a short space of time. As you (re-)learn the movements, you can add strength and muscle rapidly, which means you need to be training each muscle group 2+ times a week. On a split muscle building workout, you may only be training each muscle group once a week – meaning you’ll miss out on these accelerated gains early in your training. Sadly, it gets harder after that, so a full body program lets you take advantage of them and get a head-start on your results. Training muscle groups 2+ times a week has already been shown to be optimal, and experts in sport science have showed that more sessions – with the right recovery – bring the best strength and size gains. This is one that you need to consider if you’re balancing your workouts with other time-demands in life. Whether it’s family, work, studies, business, or simply running out of time, we don’t all have the opportunity to train 3 hours a day. A full-body muscle building workout is an easy way to get the most benefits from your training with limited time. 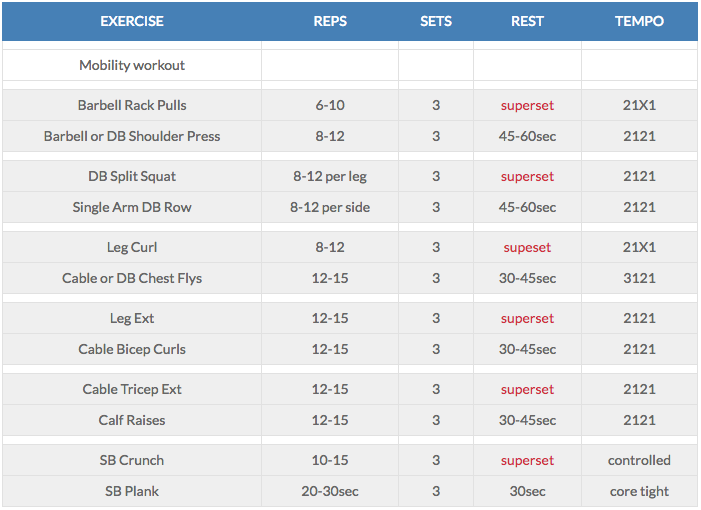 With only 6 supersets working the full body, the muscle building workout I’ve put together works your entire body in different rep ranges and with different types of exercises. If you’re willing to work hard and push yourself during the workout, you can get a great session done in only 45 minutes. This is also crucial if you’re trying to schedule your workouts around a busy week with work or family. You probably don’t have the luxury of 6 days a week to train – which is why my muscle-building workout can be completed 3-4 days a week. This gives you plenty of time to rest, recover, and grow between training sessions. Training full body 3-4 times a week is one of the best ways to improve your fitness and physique without compromising other areas of life. If you live an active life outside of the gym – whether its bike rides or organised sports – the last thing you want is to be too busy or tired to get after it. Working a full-body program is a great way to reduce DOMS and it gives you plenty of options for adding light exercise and cardio into the rest of your life. Your workout program should make you stronger and empower you to live a more active life. The full body muscle building workout is all about getting stronger, dealing with challenge, and doing it all in a way that lets you enjoy movement and activity in your day-to-day life without worrying about how it might affect the rest of your active hobbies. While muscle gain is the goal of this workout program, it is also a great way to improve your physique in the short- and long-term. In the short-term, high-volume resistance training is a great way to increase your calorie-use and promote fat loss. After heavy weight training – especially full-body – you use far more calories for more than 16 hours afterwards. This recovery cost (known as EPOC) is much higher in intense full-body strength training than cardio – either low- or high-intensity! In the long-term, gaining muscle is an amazing way to control your bodyweight and keep your metabolism going strong. Muscle is calorie-expensive, meaning that as you become more muscular you’re going to increase your resting metabolism, making fat loss easier in the future. Weight training with full-body movements has a greater effect on both of these changes – post-training calorie requirements are higher during full-body training and building muscle across the whole body in a balanced way is the easiest way to boost your resting metabolic rate. When you train for strength and muscle, you make the real gains when you’re resting and recovering. Training is a stress-stimulus that signals to your body that you need to get stronger and use the nutrients from your diet to repair and grow. This means that, when you take on a full-body muscle building workout, you need to make sure that your recovery matches up with your training. Simply put, how you recover between sessions is going to determine how much progress you can make – and how long those rapid beginner gains last for. Before we get into how to recover better, there’s one great piece of news: full body training will produce less muscle soreness than a split routine. DOMS occur when you’re dealing with an unfamiliar or excessive stimulus, which is going to be common if you’re only training a body part once a week, but the increased frequency of a full body muscle building workout allows you to adapt to the stimulus and you’ll see progressively less soreness on a training program with this type of frequency. You already know that your diet is a big player in your health and fitness. However, it’s going to be essential to a full body muscle building workout and supports you getting better on a session-to-session basis. I’ve talked about diet at length before, but the key fact is this: a high-protein, nutrient-dense diet is going to be essential for getting the most out of any muscle building workout plan. If you’re not fuelling right, I could give you the best program in the world and you’d still plateau. If you find yourself struggling to improve, look to your diet first. Of course, you can always get in touch if you’re struggling with diet and need guidance! Sleep is crucial – high-quality sleep is arguably the biggest factor in recovery. If you don’t get enough sleep (anything less than 8 hours), you’re going to struggle to maximise your results. Obviously, with a busy life and a flexible training program you can do a lot. You might not always have regular sleeping hours but try and prioritise it where possible. Next time you’re sat watching the TV late into the night, consider whether it’s worth the lack of sleep (a serious risk for your exercise performance), or whether you’d rather hit that big Personal best. You don’t always have control over every variable in your sleep schedule but being conscious is the first step to improving it and improving your results. If you’re trying to get fitter, mobility and “prehab” are worth your time. These are about reducing injury risk, keeping your joints healthy, and being able to move without restriction. Mobility starts with a simple routine of stretching. This is another time-demand, but I like to start with 5-10 minutes twice a day. Stretching is neural, so it’s more like practicing a skill than literally stretching your muscles until they’re longer. There are some great, simple mobility programs that you can work through – or we can work together to develop a personalised stretching program that addresses your personal weaknesses. It’s better to do it more often rather than just having a marathon stretching session once a week. Prehab are exercises that are aimed at improving your posture, balancing demands on joints, and protecting you from injury. We do a few of these in the muscle building workout, but you can add a few simple bits and pieces with resistance bands, light weights, or even bodyweight. Taking care of yourself is key: nothing inhibits your ability to get strong quite like injury. It’s the fastest way to ruin your motivation and slow your progress, so invest a bit of time into stretching and prehab exercises – it’ll pay dividends down the line. This is the final point that needs mentioning: you have to be strict with yourself on rest days. You can do a lot of relaxed, light exercise, but taking days off from the gym is crucial. With the extra work you’re doing on a full-body muscle building workout, you need to make sure you’re taking a day off between training sessions. This isn’t just to reduce your risk of injury, but to make sure that you’re fresh and ready when you get back into the gym. The full body muscle building workout is fun – and you might want to train more – but stick out the program and get your rest days in. These are the times when you’re building muscle and skipping a rest day is an easy way to have a rough workout! Life doesn’t always play fair and sometimes you might not have a choice but sticking to an every-other-day schedule is a great way to maximise your results on the full body program. Combine this intense training with great recovery – and maybe a little bit of fun activity on your rest days – and you’ll find yourself building serious muscle, sustainably, into the future.